우리나라의 조기위암 내시경치료 논문에 undifferentiated type EGC, undifferentiated histology, 또는 undifferentiated carcinoma 등 의미가 불명확한 용어가 널리 사용되고 있습니다. 그러나 이런 표현으로 인하여 적지 않은 혼란이 발생하고 있습니다. 국내외에서 이를 지적하는 목소리도 적지 않습니다. 이유는 두 가지입니다. (1) WHO에서 정의한 위암 조직학적 분류에 undifferentiated carcinoma(전체 위암의 1% 미만에 해당하는 드문 형태)라는 것이 있습니다. 이것과 구분이 어렵기 때문입니다. 서로 완전히 다른 개념임에도 불구하고 undifferentiated라는 같은 단어가 쓰이고 있으므로 혼란은 불가피합니다. (2) 서구와 달리 일본 병리의사들은 과거부터 위암의 조직학적 분류에서 differentiated vs undifferentiated라는 용어를 써 왔습니다. 이는 우리나라 논문에 사용되는 undifferentiated type, undifferentiated histology, 또는 undifferentiated carcinoma 등과 미묘한 차이가 있습니다..
이러한 혼란은 우리나라 병리 선생님들과는 무관한 문제입니다. 우리 병리 선생님들은 WHO 기준에 따라 적절하게 분류하여 진단을 내고 있습니다. 단지 소화기내과나 외과 의사들이 poorly differentiated adenocarcinoma와 signet ring cell carcinoma로 보고된 것을 undifferentiated type, undifferentiated histology, undifferentiated carcinoma 등의 용어로 묶어서 생각하고 습관이 있을 뿐입니다. 이러한 용어를 그대로 논문에 사용하면서 적지 않은 문제가 발생하고 있는 것입니다. 일본은 병원에 따라 병리 보고서에 원래부터 differentiated vs undifferentiated라는 용어가 쓰이는 모양입니다. 그렇다면 이를 그대로 논문에 사용해도 별 문제가 없습니다. 국제 표준인 WHO 분류가 아니라는 점에서 별로 좋지는 않지만, 그냥 일본 고유의 현상으로 받아들이면 그뿐인 것입니다. 참 특이한 일이군.... 뭐 이렇게 생각하면 그만입니다. 그런데 일본만의 특이한 용어(분화암, 미분화암)를 우리가 흉내낼 일은 아닌 것 같습니다. 우리 병리과 선생님들의 보고서에 없는 개념을 우리 임상의들이 적당히 묶어 새로 이름지은 용어를 쓸 이유가 없는 것입니다. 저는 undifferentiated 이슈에 대하여 아래와 같이 생각하고 또 주장합니다. 1) Undifferentiated carcinoma(미분화암)는 WHO에서 말한 드문 형태의 암입니다. P/D adenocarcinoma와 signet ring cell carcinoma를 통칭하는 용어가 아닙니다. 2) Undifferentiated adenocarcinoma라는 말은 쓰지 맙시다. 틀린 말입니다. 형용모순어입니다. 절대 쓰면 안됩니다. 3) P/D adenocarcinoma와 signet ring cell carcinoma를 통칭하는 용어는 gastric carcinoma with undifferentiated type histology (미분화조직형 위암)로 통일하는 것이 좋겠습니다. 논문에는 옳지 않은 말, 불명확한 말, "일본인들만 쓰는 말"은 피하는 것이 좋겠습니다. 우리 병리과 선생님들이 우리 병리보고서에 언급한 말만 그대로 쓰는 것이 좋겠습니다. 바르고 정확한 용어가 모든 학문의 출발점이니까요. 국제표준용어나 우리의 용어를 씁시다. 일본 것 베끼지 맙시다!!!!! WHO의 IARC (International Agency for Research on Cancer)에서는 위암을 크게 carcinoma와 neuroendocrine neoplasm으로 나누고 있습니다 (reference). 이 중 gastric carcinoma는 아래와 같이 나누어집니다. 8020/3 Undifferentiated carcinoma - (필자 주) 우리말로 '미분화암'입니다. WHO의 IARC (International Agency for Research on Cancer)에서 제공하는 PubCan에 따르면 signet-ring cell carcinoma는 개념적으로 adenocarcinoma에 포함됩니다. PubCan에서 다음과 같이 정의하고 있습니다. "This type is defined as a tumour composed predominantly or exclusively of signet-ring cells, characterized by a central optically clear, globoid droplet of cytoplasmic mucin with an eccentrically placed nucleus. In some cases, signet-ring cells may be restricted to the mucosa in combination with other variants of poorly cohesive cells within the deeper levels of the gastric wall." 같은 자료에서 undifferentiated carcinoma of the stomach은 다음과 같이 정의됩니다. "Undifferentiated carcinoma is a usually aggressive, malignant epithelial neoplasm composed of atypical cells which do not display evidence of glandular, squamous, or urothelial cell differentiation." 따라서 glandular differentiation을 보이는 adenocarcinoma는 아무리 poorly differentiated라고 하더라도 undifferentiated carcinoma로 부를 수 없습니다. WHO classification (4th, 2010)에서 Lauwers 등이 쓴 위암 파트에는 undifferentiated에 대하여 거의 설명되어 있지 않습니다. 다만 rare histological variants의 하나로 언급되어 있을 뿐입니다. 흥미로운 점은 other classification scheme에 Lauren, Ming, Nakamura, Mulligan, Goseki, Carneiro 등의 방식이 소개되어 있다는 점입니다. 이 중 Nakamura 방식은 아래와 같은 단 한 문장으로 설명되어 있습니다. "Nakamura categorizes all tumours as either differentiated or undifferentiated." 서양 의사들도 Nakamura 방식을 알고 있기는 하는 것입니다. 다만 표준 분류로 간주하지 않고 있을 뿐입니다. 우리는 표준 분류를 따라야 한다고 생각합니다. 2. 우리나라 소화기 병리의사들이 undifferentiated carcinoma라는 용어를 사용하는 방법 - 정확히 WHO 기준에 따르고 있습니다. 2014년 현재까지 우리나라 위암병리판독의 기준으로 간주되는 2005년 대한병리학회 소화기병리학연구회의 위암 병리보고서 기재사항 표준화 (PDF 0.3M)에는 (1) 위암의 histologic type은 2000년 WHO 분류를 따름, (2) 두 가지 이상의 분화도가 섞여 나올 때는 간질을 제외한 암세포의 면적이 가장 많은 유형으로 분류함, (3) 선구조나 편평상피 분화가 없는 경우에는 undifferentiated carcinoma로 분류함을 명확히 밝히고 있습니다. 즉 병리보고서 기재사항 표준화 방안에 따르면 poorly differentiated tubular adenocarcinoma나 signet-ring cell carcinoma는 분명히 undifferentiated carcinoma에 속하지 않습니다 (아래 그림 참조). 2004년 대한소화기내시경학회에서 발간한 '치료 소화관 내시경 길잡이'의 '조기위암 내시경 치료 후 병리학적 결과 판정법'(21쪽)에서 조기위암 완전절제 판단기준을 아래와 같이 언급하고 있습니다. 즉 분화형 위암과 미분화형 위암이라는 용어를 사용하지 않고 있습니다. 4. 우리나라 ESD 관련 논문에서는 어떻게 사용되고 있는가? - Undifferentiated type, undifferentiated histology, 또는 undifferentiated carcinoma라는 용어가 혼용되고 있다. 2007년 국내 최초의 조기위암 내시경치료 다기관연구(Gastrointest Endosc 2007)에서는 undifferentiated에 대한 언급이 아래와 같이 두 번 나옵니다. Undifferentiated histology가 무엇인지 정확히 정의하지 않은 상태에서 poorly differentiated adenocarcinoma와 signet ring cell carcinoma를 undifferentiated type으로 간주한 것 같습니다. 이 연구의 자료수집에 저도 주도적으로 참여하였는데, 당시 이러한 문제점을 깊이 인지하지 못했습니다. The resection was regarded as incomplete if histopathologic examination revealed a positive resection margin or submucosal invasion or positive lymphovascular invasion or undifferentiated histologic diagnosis. Twenty-seven tumors (5.3%) were classified into undifferentiated type (18 poorly differentiated adenocaracinomas and 9 signet ring cell carcinomas). 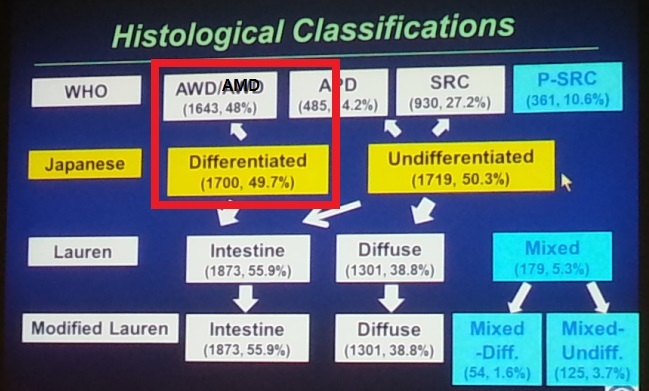 제가 2저자로 참여하였던 논문(Digest Liver Dis 2009)에서도 undifferentiated histology라는 용어를 사용한 적이 있습니다. 아래 table에서 저희는 "Undifferentiated histology included the cases with poorly differentiated or signet ring cell carcinoma"라는 설명을 붙였습니다. 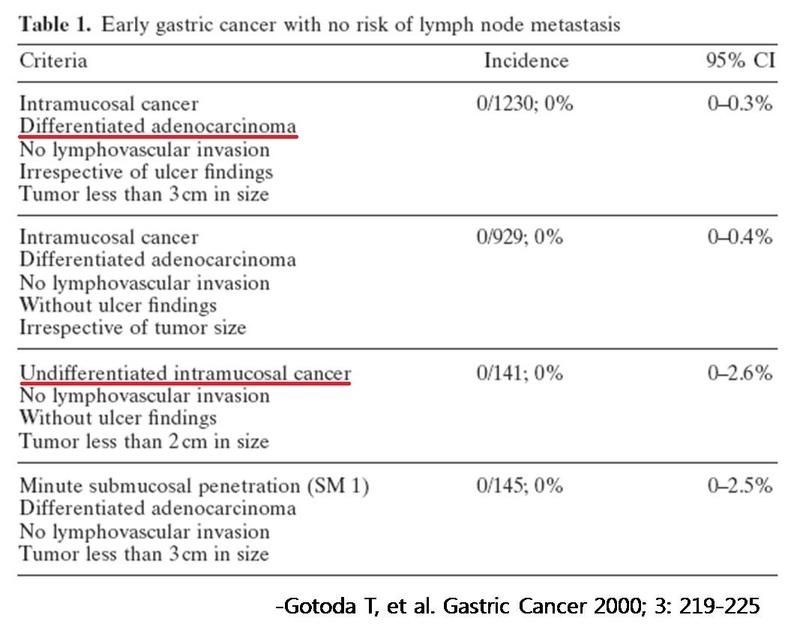 저희 병원의 또 다른 논문(Surg Endosc 2011)의 discussion에 "Undifferentiated cancers were excluded from the comparison because, even when small, they have a high risk of lymph node metastasis and are not usually treated endoscopically"라는 표현을 사용한 적이 있습니다. 5. 일본에서는 어떤 의미로 사용되고 있는가? 저는 일본에서 undifferentiated adenocarcinoma가 어떤 의미로 사용되고 있는지 정확히 알지 못합니다. 최근 가톨릭대학교에서 나온 논문(World J Surg Oncol 2012)에 아래와 같은 언급이 있는데, 일본 사정을 정확히 반영하고 있는지 저로서는 확인할 도리가 없습니다. 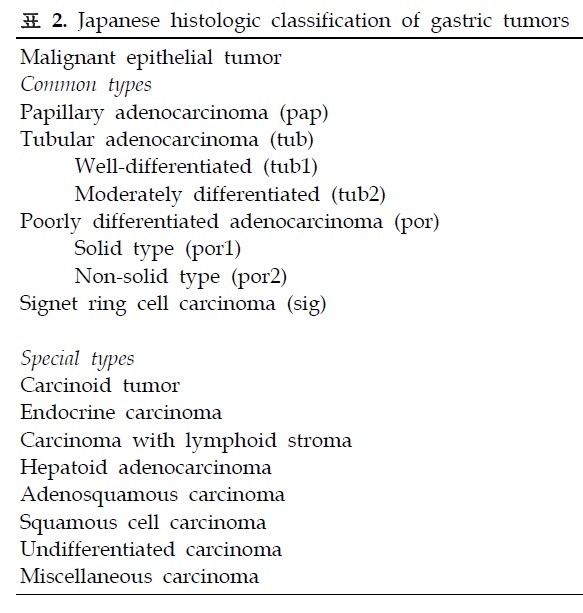 The Japanese classification system categorizes gastric adenocarcinomas into two groups: differentiated and undifferentiated. The differentiated group consists of well-differentiated, moderately-differentiated and papillary adenocarcinoma. The undifferentiated group consists of poorly differentiated adenocarcinoma (PDAC) and SRC. Interestingly, mucinous adenocarcinoma can be regarded as either a differentiated or undifferentiated type depending on the predominant components. 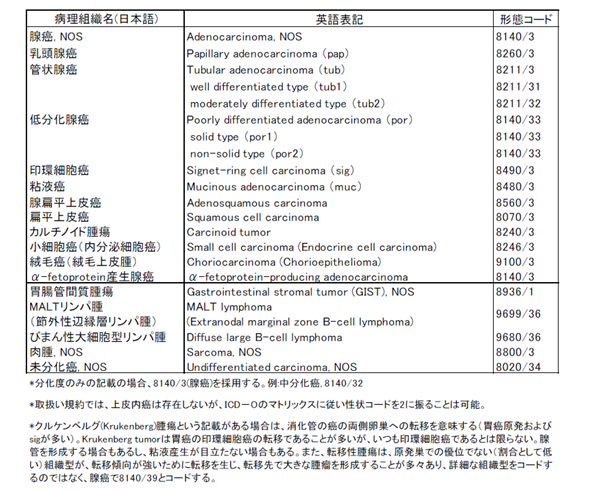 In the same context, Nakamura categorized all gastric cancer as either differentiated or undifferentiated. 아주 오래 전에 일본에서 위암을 differentiated와 undifferentiated로 나누는 관례가 생긴 것 같습니다. 1970년대 혹은 1980년대 논문에서는 자주 씌이고 있습니다. 요즘은 좀처럼 논문에서 찾아보기는 어렵습니다. 단지 임상의 병리보고서에서 아직 씌이고 있는 모양입니다. 오래된 일본 논문 초록을 옮깁니다. 1982년입니다. 현재 개념으로 보면 약간 이상한 이야기도 많이 씌여 있습니다. 옛날 이야기인 것이지요. Historical review of the pathological investigation on stomach cancer in Japan shows that the central problem had been whether or not gastric cancer developed from chronic peptic ulcer. This theory of ulcer cancer sequence was developed from chronic peptic ulcer. This theory of ulcer cancer sequence was supported by many researchers after the war in the period of 1946-64. Subsequently, systematic studies made at the Cancer Institute revealed that carcinoma arises from the gastric mucosa independently of chronic ulcer. The pathological interest then shifted toward investigation of the histogenesis and biological characteristics of gastric carcinoma. It is concluded that gastric carcinoma can be classified into two types; undifferentiated carcinoma (UCA or gastric type) and differentiated one (DCA or intestinal type). The former arises from the ordinary mucosa and cancer phenotype of this carcinoma resembles to that of the ordinary mucosa, and the latter arises from the metaplastic epithelium of intestinal type showing a cancer phenotype resembling to that of the intestinal metaplastic epithelium. These two carcinomas are also different in biological behaviors, such as growth pattern, invasiveness, metastasis, and prognosis. The frequency of UCA is almost the same in both sexes. DCA, however, occurs more often in male than in female. The time trend data indicates that in both sexes the number of DCA decreased, but that of UCA is steady, so that the ratio of DCA to UCA decreased since 1965. These results combined with the concept of the basic and variable cancer leads to a conclusion that UCA is a basic cancer and DCA is a variable cancer of the stomach. 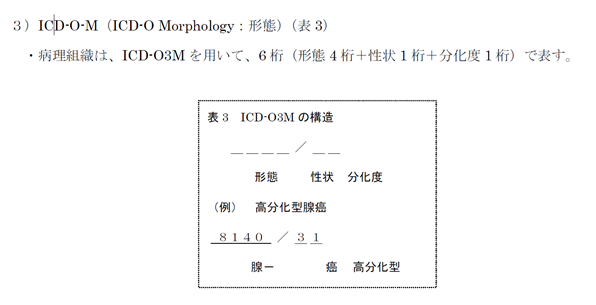 Japanese Red Cross Kyoto Daiichi Hospital의 근간 논문(Digestion 2012)에는 "who had a final pathological diagnosis of undifferentiated adenocarcinoma (por, sig, or por+sig) were enrolled this study"라는 부분이 나옵니다. 즉 일본에서도 병원에 따라서는 poorly differentiated adenocarcinoma와 signet ring cell carcinoma를 undifferentiated adenocarcinoma로 언급하는 경우가 있는 것입니다. 이 병원 병리과 스타일은 우리나라와 비슷하게 WHO 분류법을 이용하는 모양입니다. 이를 임상의가 부적절하게 differentiated vs undifferentiated의 틀로 묶어서 논문을 낸 것 같습니다. 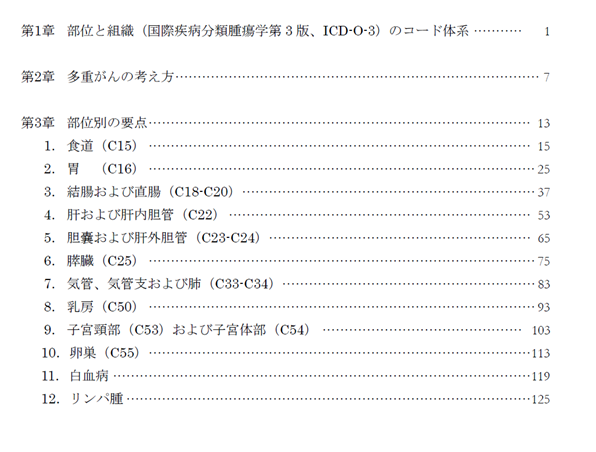 1998년 발표된 일본위암분류(Japanese Classification of Gastric Carcinoma - 2nd English Edition -)에 따르면 일본에서 외과의사들이 이해하고 있는 위암의 조직학적 분류는 아래와 같습니다 (Reference). 당시 분류법에서는 differentiated와 undifferentiated의 구분은 없습니다. 단지 다음과 같은 note가 하나 있을 뿐입니다. "Note 1: Undifferentiated carcinoma combined with a small adenocarcinoma component should be classified as poorly differentiated adenocarcinoma." 유명한 오래된 논문을 소개합니다. 이 논문에서는 differentiated vs undifferentiated의 틀이 사용되고 있습니다. 즉 WHO의 위암 분류가 별로 반영되지 않았습니다. 그러나 같은 저자의 근간 리뷰에서는 well differentiated, moderately differentiated 등 WHO 분류법이 언급되고 있습니다. 간혹 undifferentiated adenocarcinoma라는 애매한 용어가 아직 씌이고 있다는 것을 알 수 있지만... 사실은 틀린 용어입니다. Adenocarcinoma는 gland 분화를 보인 것이므로 undifferentiated일 수 없습니다. 아래에 나오는 병리과 선생님은 이러한 잘못을 '형용모순(oxymoron)'이라고 설명하고 있습니다. 일본 의사들은 용어를 정확히 정의하지 않고 대충 사용하는 것으로 유명합니다. Differentiated/undifferentiated 이슈에 대해서도 적용됩니다. 즉 일본 의사들도 명확히 정의하지 않고 사용하는 것을 우리나라 의사들이 따라하고 있는 셈이니 본질적으로 혼란이 가중될 수 밖에 없습니다. 혼란을 피하기 위해서는 우리 스스로 일본을 흉내내던 구태에서 벗어나는 수 밖에 없습니다. 일부 일본 의사들이 differentiated vs undifferentiated라는 분류의 틀이 국제적인 견지에서는 적절하지 않다는 것을 인지하기 시작하는 것 같습니다. 그러나 대다수의 일본 의사들은 자신들의 고유한 방식을 사용하고 있습니다. 예를 들어 2010년 일본 위암 치료 가이드라인에서는 아직도 용어의 사용이 이상합니다. Differentiated라고 씌인 곳도 있고 differentiated type이라고 씌인 곳도 있습니다. 대한병리학회 소화기병리학연구회에서 발표한 위암 병리보고서 기재사항 표준화 (2005)와 대한의학회에서 발간한 위암표준진료권고안 (2012)[관리자 주: 분량을 약간 줄여서 근거기반 위암진료 권고안(대한소화기학회지 2014)으로 다시 발표됨]에 의하면, 위암의 병리 진단 보고서에 위암의 조직형(histological type)에 대한 기재는 기본적으로 WHO 분류(표 1)를 따르며 Lauren 분류를 추가할 수 있다. 실제로 대부분의 병리의사들은 권장사항에 따라 내시경 생검의 경우에는 WHO 분류만, 절제 위암의 경우에는 WHO 분류와 Lauren 분류를 동시에 기재하고 있다. 위암 WHO 분류의 병리학적 진단 기준은 비교적 잘 정립되어 있고 보고서 작성의 표준화도 상당부분 이루어져 있어서 위암의 조직학적 분류 자체의 큰 문제점은 없다. 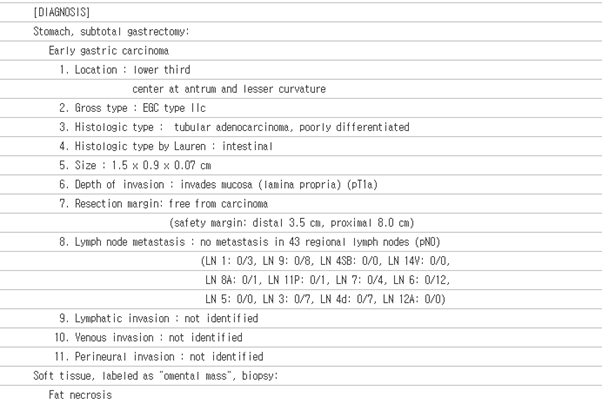 한편 일본 위암 분류(Japanese classification of gastric carcinoma - 2nd English edition)에는 위암의 95%를 차지하는 선암종(adenocarcinoma)의 조직학적 아형들(표 2)을 분화형(differentiated type)과 미분화형(undifferentiated type)으로 나누는 조직학적 분류가 기술되어 있다[관리자 주: 2010년 일본 위암 치료 가이드라인].이 분류는 소화기내과및 외과 의사들에게 널리 사용되며 특히 위암의 내시경치료의 적응증의 기준으로써 그 중요성이 높다. 그러나, “선암종의 조직학적 분류에 따른 미분화형”이라는 의미로 사용되는 용어가 단일화되어 있지 않고 매우 다양하며, 위암 WHO 분류상 선암종과는 별개로 정의된 “미분화암종(undifferentiated carcinoma, ICD-O code: 8020/3)”이라는 용어와 혼동될 가능성이 있다. 또한 이 분류는 병리보고서에는 대부분 기재되지 않기 때문에, 소화기내과 및 외과 의사들 나름의 기준을 가지고 분류하게 된다. 따라서 여기에서 발생할 수 있는 몇 가지 문제점에 대한 고찰이 필요하다고 생각한다. “Undifferentiated”라는 용어는 의학적으로도 쓰임이 많다. 우리말로는 “미분화”이며, 이는 전혀 분화가 되지 않음을 의미한다. 즉 원시적인 미성숙 상태에 머물며 어떤 쪽으로도 분화가 되지 않음을 뜻한다. 병리 진단에서도 undifferentiated tumor와 같은 용어가 사용되는데, 종양세포가 매우 미성숙하여 조직학적으로 어떠한 분화의 기미도 찾아 볼 수 없는 종양을 일컫는다. 따라서 종양의 진단에서 “undifferentiated”라는 용어는 특정 분화의 의미를 내포하지 않은 용어인 tumor, neoplasm, carcinoma, sarcoma 등과 같이 쓰인다. 즉 “undifferentiated”라는 용어는 특정 분화의 의미를 내포하는 용어인 선암종(adenocarcinoma), 편평세포암종(squamous cell carcinoma), 간세포암종(hepatocellular carcinoma)등과는 같이 쓸 수 없다. 따라서 위암의 조직학적 분류상에서 종종 사용되는 “undifferentiated adenocarcinoma”이라는 용어는 일종의 형용모순(oxymoron)인 셈이다. 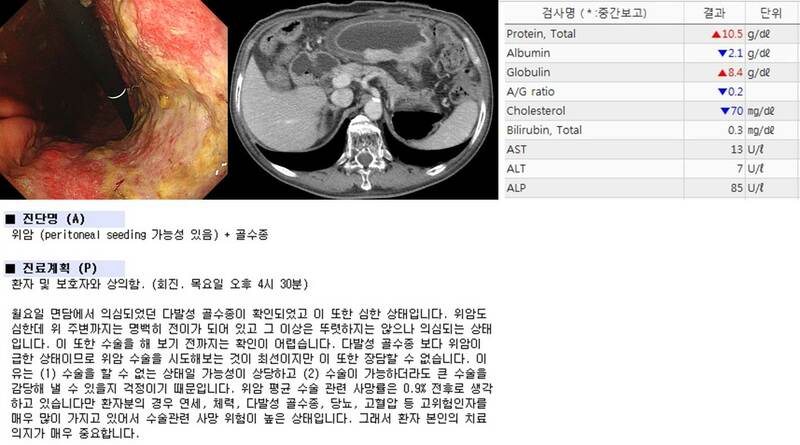 한편 위암 WHO 분류에 명시된 미분화암종(Undifferentiated carcinoma)은 매우 미성숙한 종양세포로 구성되어 상피세포 기원이라는 근거 이외에는 어떤 분화도 보이지 않는 종양으로써 전체 위암의 1% 미만으로 매우 드물며, 미분화(조직)형 선암종(undifferentiated type adenocarcinoma)과는 완전히 다른 것이다. 일본 위암 분류에 기술된 위암의 조직학적 분류상의 미분화(조직)형 선암종을 대상으로 연구한 논문들에서 이를 지칭하는 데는 매우 다양한 표현방식이 사용되고 있다. 아래의 용어들은 실제로 논문에 사용된 것들이다. 상기 용어들을 살펴보면, 미분화(조직)형에 대한 표현 방식이 “undifferentiated-type”, “undifferentiated type”, “undifferentiated histology”, “undifferentiated type histology” 또는 단독으로 “undifferentiated”만 쓰인 경우까지 매우 다양하다. 게다가 carcinoma, adenocarcinoma, cancer까지도 혼용함으로써 용어의 혼란을 가중시키고 있다. 특히 “undifferentiated carcinoma”라는 용어는 앞서 언급된 바와 같이 WHO 위암 분류 ICD-O code 8020/3로 분류되는 미분화암종(undifferentiated carcinoma)과 용어상으로는 전혀 구분되지 않는다. 따라서 선암종의 미분화조직형을 나타내고자 할 때는 “type” 또는 “histology” 등의 용어를 함께 사용하여 구별되도록하는 것이 바람직하다. 또한 일본 위암 분류에 기술된 분화형과 미분화형으로의 구분은 암종(carcinoma) 전체를 대상으로 한 것이 아니라 선암종(adenocarcinoma)만을 대상으로 한 것이므로 adenocarcinoma로 정확히 사용하는 것이 바람직하다. 따라서 개인적으로는 미분화형 선암종(undifferentiated type adenocarcinoma) 또는 미분화 조직형 선암종(adenocarcinoma with undifferentiated type histology)이 가장 적절한 표현방식이라고 생각한다. 그러나 이에 대한 좀 더 많은 의견 수렴이 필요할 것으로 생각된다. 일본 위암 분류 (1998)에 언급된 분화형, 미분화형으로의 조직학적 구분에 대한 기술은 아래와 같이 매우 간단하다. ‘In clinicopathological or epidemiological studies, papillary or tubular adenocarcinoma can be interpreted as differentiated or intestinal type whereas "por" and "sig" can be regarded as the undifferentiated or diffuse type. Mucinous carcinoma can be interpreted as either intestinal or diffuse, depending upon the other predominant elements (pap, tub, por or sig)’. 일본의 선암종 분류법은 WHO 분류와 큰 차이를 보이지는 않지만 몇 가지 서로 다른 용어를 사용하고 있다. WHO 분류에서는 tubular adenocarcinoma를 well, moderately, poorly differentiated로 나누는 반면, 일본 분류법에서는 well, moderately differentiated인 경우만 tubular adenocarcinoma로 부르고 poorly differentiated인 경우는 poorly differentiated adenocarcinoma, solid type(por 1)으로 부른다. WHO 분류상 poorly cohesive carcinoma는 일본 분류상으로는 poorly differentiated adenocarcinoma, non-solid type(por 2)에 해당된다. 따라서 일본 분류상 tubular adenocarcinoma는 모두 분화형(differentiated type)에 해당되지만, WHO 분류상에서는 tubular adenocarcinoma라도 poorly differentiated인 경우는 미분화형, 나머지는 분화형에 해당된다. 한편 점액성선암종(mucinous adenocarcinoma)의 경우는 분화형 또는 미분화형으로 나뉘어 분류될 수 있다는 추가적인 기술에 주목할 필요가 있다. 점액성선암종은 조직학적으로 세포외점액(extracellular mucin) 내에 종양세포가 떠있는 형태를 취하는데, 이때 종양세포가 선구조를 잘 형성하는 경우와 선구조를 형성하지 않고 인환세포(signet ring cell)를 흔히 포함하는 경우로 나누어지기도 한다. 즉 세포외점액을 제외하고 종양세포의 형태만 고려하여 분화형인지 비분화형인지를 나누는 방식인데, 이 경우 미분화형 점액성선암종이 분화형 점액성선암종에 비하여 예후가 나쁘다는 보고가 있다. 따라서 상기 기술은 점액성선암종을 분화형과 미분화형을 재분류 후 각각 분화형, 미분화형으로 분류하라는 의미로 해석할 수 있다. 그러나 이 부분 역시 추가적인 논의가 필요할 것으로 생각된다. 미분화형 선암종(undifferentiated type adenocarcinoma)이라는 용어는 형용모순어이고 미분화암종(undifferentiated carcinoma)와 혼동 될 수 있다는 점에서는 사용을 지양해야 할 것으로 생각된다. 그러나 이 용어가 소화기내과 및 외과 의사들에게 널리 알려져 있고 중요도가 높다는 점에서 이에 대한 필요성은 앞으로도 계속될 가능성이 높다. 따라서 용어로 인한 혼란과 오해를 최소한으로 줄이기 위한 고민과 적절한 방안이 필요하다고 생각한다. 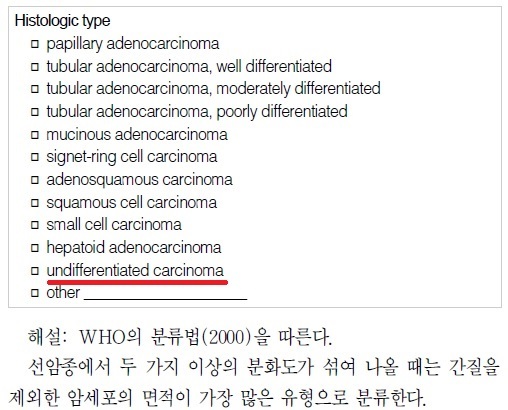 1) WHO에서 언급한 undifferentiated carcinoma는 그대로 인정해야 합니다. 우리말로는 미분화암입니다. 2) "Undifferentiated histology는 differentiated type histology 에 상반되는 개념으로 poorly differentiatd adenocarcinoma or signet ring cell carcinoma를 의미하는 표현"이라는 병리과 선생님의 의견에 동의합니다. Undifferentiated type histology은 우리말로 '미분화조직형'입니다. 이를 '미분화암'으로 부르면 안 됩니다. 3) Signet ring cell carcinoma가 carcinoma인 것은 맞습니다. 그러나 tubular adenocarcinoma는 아닙니다. 따라서 P/D와 signet ring cell carcinoma를 포함한 개념을 undifferentiated adenocarcinoma라고 부르는 것은 부적절합니다. 4) 따라서 아래와 같이 요약할 수 있습니다. Gastric carcinomas with differentiated type histology W/D & M/D adenocarcinoma . Gastric carcinomas with undifferentiated type histology P/D adenocarcinoma & signet ring cell carcinoma 1. 무척 헷갈리는 말이므로 가급적 쓰지 않는 것이 좋겠습니다. 2. 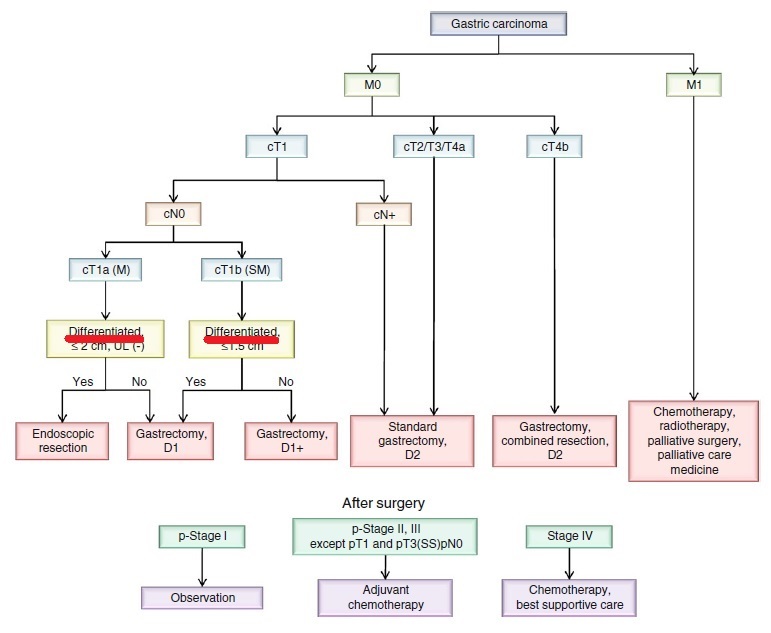 WHO의 undifferentiated carcinoma(미분화암)와 분명히 다른 개념입니다. 5) 여기까지 정리해 보았으나 여전히 문제는 남습니다. '있다'는 '있다'고 '없다'는 '없다'입니다. '조금 있다'는 '있다'입니다. Poorly differentiated, 즉 저분화는 약간만 분화되었다는 뜻입니다. 분화냐 아니냐를 따지자면 '분화' 쪽입니다. Poorly differentiated는 differentiated인 것입니다. 이를 무리해서 undifferentiated로 부르니 이상한 것입니다. 즉 '(조금) 있다'를 '없다'로 부르는 셈이니 이상한 것입니다. 일본식 differentiated/undifferentiated 분류의 모순입니다. 서양사람들은 절대로 이해할 수 없습니다. 결국 원점으로 돌아가는 이야기입니다만, 우리는 일본식 분류를 쓰지 말고 는 WHO 분류만 쓰는 것이 좋겠다는 생각입니다. 아니면 우리 것을 만들던지. 일본 병리의사들은 나름대로의 고집이 있습니다. 이는 잘못된 것이 아닙니다. 다만 우리와 다를 뿐입니다. 우리나라 병리의사들도 나름대로의 고집이 있습니다. 이 또한 잘못된 것이 아닙니다. 다만 일본 병리의사들보다 우리니라 병리의사들이 WHO 분류에 더 가까울 뿐입니다. 일본 내시경의사들은 일본 병리의사들과 함께 일합니다. 파트너인 일본 병리의사의 견해와 용어가 일본 내시경의사의 행동과 글쓰기에 녹아들어 갈 수 밖에 없습니다. 우리 내시경의사는 우리 병리의사와 함께 일해야 합니다. 우리 병리의사의 견해와 용어를 존중하고 함께 발전해야 합니다. 문제의 시작은 우리 내시경의사가 우리 병리의사의 견해와 용어보다 일본 내시경의사의 견해와 용어에 더 익숙하다는 것입니다. 사실 저도 우리 병리의사가 쓴 논문보다 일본 내시경의사가 쓴 논문을 더 많이 보고 있습니다. 역사적으로 일본이 위내시경분야를 선도했습니다. 그래서 일본을 참고하지 않을 수 없습니다. 예전만은 못하지만 아직도 상당한 영향력이 남아있기 때문에 어쩔 수 없는 측면도 있습니다. 그러나 이제부터는 우리 스스로 좀 더 조심스럽고 진지해질 필요가 있다고 생각합니다. 일본과 우리의 차이를 정확히 인식한 상태에서 냉철한 태도로 비판적 글읽기를 시작합시다. 일상 진료에서 그리고 논문 쓰기에서 용어를 좀 더 주의하여 사용합시다. 우리 병리의사와 좀 더 소통하여 우리의 방식을 우리 스스로 만들어 나갑시다. 우리 병리선생님들도 저의 제안에 적극 동참해 주실 것을 기대합니다. 감사합니다. 이 원고를 작성하는데 많은 분들의 도움이 있었습니다. 이 자리를 빌어 감사드립니다. 일본 병리의사 교육과정에는 differentiated vs. undifferentiated 암을 구분하는 안목을 키우기 위한 긴 과정이 있다고 합니다. 비교적 분류가 쉬운 갑상선암부터 시작해서 비뇨기계, 산부인과계 암 등...그리고 가장 마지막에 혼돈이 많고 어려운 위장관암의 differentiated vs. undifferentiated암을 진단내리는 훈련과정을 거친다고 들었습니다. WHO 분류를 따르라는 서양의 압박에도 불구하고 이 과정을 고집하는 이유는 치료방침 결정과 예후 판단에 더 잘 들어맞기 때문이라고 합니다. 예를 들면, 갑상선암의 경우, 미분화형암만 수술적 절제를 요하는 경우가 많은데, WHO 기준을 따르다보면 거의 모든 감상선암을 수술하게 되기에, 이를 막기 위해서라도 일본 병리 분류를 고집할 수 밖에 없다는 설명입니다. 위암에서의 분화형/미분화형 용어 사용 자제 이후에 "말도 안 된다. PD + signet ring cell ca = 미분화암이라는 걸 거부하면, 지금의 한국과 일본의 분화형 : 미분화형 암의 비율은 어떻게 설명할 것이냐, 그러면 왜 일본에서 분화형 암이 그렇게 많냐"고 반발하시는 교수님들이 계셨는데, 이는 다음과 같이 보조 설명을 하시면 될 것 같습니다. 국제 암 연구소에 등록된 일본 위암 중 약 1/3은 점막내암이거나 WHO 기준상 이형성증을 지닌 선종에 해당하는 종양들입니다. 이들이 일본 논문에서는 모두 분화형 암으로 보고되기에, 우리나라 선생님들이 생각하시는 분화형 암(MD 90% + signet ring cell 10%)이 일본에서는 미분화형으로 분류되더라도, 일본에서는 여전히 분화형 암이 많을 수 밖에 없는 것입니다. 일본 위암 지침서에는 "고도의 이형성증을 지닌 선종"이란 용어 자체가 없습니다. 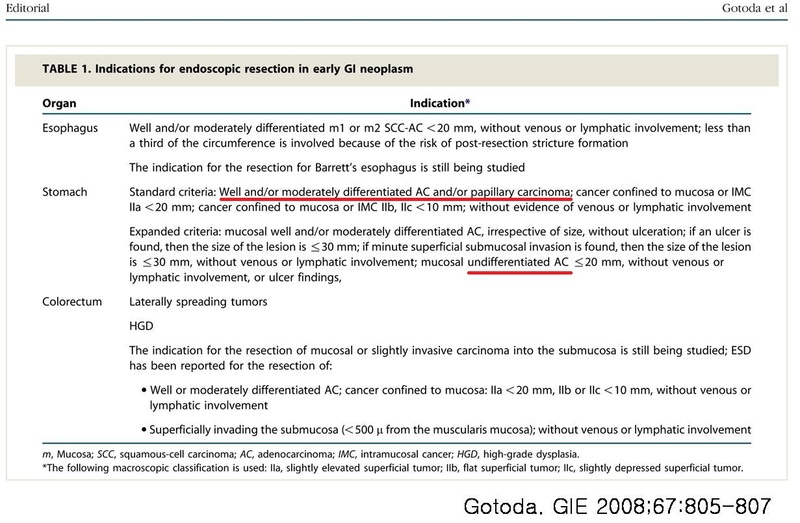 연세대학교에서 'Is new criteria for mixed histology is necessary for endoscopic resection in EGC? '라는 제목의 발표를 하였습니다. 제가 흥미롭게 본 것은 Japanese classification입니다. 우리는 흔히 일본에서 말하는 differentiated cancer는 WHO 분류로 well-differentiated와 moderately-differentiated adenocarcinoma를 합한 것과 비슷하다고 생각합니다. 그런데 이번 발표를 보니 일본 분류에서 differentiated가 49.7%인 반면 well-differentiated와 moderately-differentiated adenocarcinoma의 합은 48%였습니다. 즉 2% 차이가 있습니다. 이 환자들은 어떤 조직학적 특징인 있는지 궁금할 뿐입니다. 일본 분류를 WHO 분류와 mapping하는 일은 무척 어려운 일입니다. 2% 부족합니다. 오늘 연락을 드리는 이유는 '분화형 위암’과 '미분화형 위암'에 대한 분류가 학술대회 연자의 강의록에서조차 참고문헌 없이 잘못 기술되어 있고, 대부분의 청중은 무엇이 왜 틀린지 조차 모르고 있다는 걸 느꼈기 때문입니다. EndoTODAY에서도 여러 차례 다루어주셨기에 지금쯤은 “왜 한국병리의사가 판독한 WD, MD, PD, Sig, Muc 위암을 일본병리의사가 판독한 분화형/미분화형으로 마음대로 분류하면 안 되는지”를 대부분 알고 계실 거라 생각하고 있던 터라 매우 충격적이었습니다. 요점부터 말씀드리자면 'WD + MD = 분화형', 'PD + Sig + Muc = 미분화형'이 아닙니다. 암의 분화도와 조직계는 엄연히 다르기에 muc 위암의 일부는 분화형에 해당합니다. 또한, 일부 MD는 PD나 sig와 혼재되어 있어 미분화형 위암에 해당되므로, WHO분류의 MD 위암이 일본병리기준상 분화형 위암일거라고 단정짓는 것은 매우 위험합니다. 변호사의 설명을 요약하면 다음과 같습니다. 조기암일 때는 점액의 대부분이 위내강으로 방출되어 점액호수가 형성되지 않기에, muc으로 진단될 때는 이미 진행형 위암인 경우가 많다. 그러나 위암이 단일 조직계로 구성되는 경우는 거의 없고, 대부분이 복수의 조직계로 구성되는 혼합형이기에 주의해야 한다. 이외에 유사 의료소송증례들을 다룬 변호사들이 정리해 둔 주의사항들은 다음과 같습니다. 위암의 병리판독은 크게 조직계와 분화형의 두가지로 제공되는데, 조직계(pap, tub1, tub2, por, sig, muc)과 분화형(differentiated, undifferentiated)는 별도의 병리판독기준을 따르므로 혼동하지 말아야 한다. muc은 분화형과 미분화형 위암 모두에서 진단될 수 있으며, 진행형 위암인 경우가 많다. Sig 는 유전자 변이(aneuploid DNA)가 발생해야만 진행암으로 진행하며, 변이가 없으면 예후가 좋으므로 'sig = 미분화형암 = 예후가 나쁠 것'이라는 편견을 버린다. Sig로만 구성된 위암이 B-IV까지 진행하는 경우는 없으며, por가 섞여있어야만 진행한다. 분화형 위암은 시간이 지나면서 미분화형 위암으로 바뀔 수 있으며, E-cadherin 변이 없이도 발생할 수 있으므로 주의한다. 결론적으로, 분화형/미분화형위암은 병리의사가 일부러 시간을 내서 일본이중분류법에 기준하여 판독해서 추가로 기입하지 않는 한 판단할 수 없으며, WHO 기준으로 병리의사가 판독한 WD, MD, PD, Sig, Muc 위암을 임상의사가 마음대로 분화형/미분화형으로 분류하는 것은 틀린 지식이라고 말씀드리고 싶습니다. 추신: 공식판독기준자료를 파일로 첨부합니다 (PDF file, 일본어입니다). 다음은 첨부화일의 4쪽에 있는 표로서 Muc은 PD, Sig와 각각 다른 코드로 분류하고 있으며, 분화형/미분화형은 이와 별도로 병리의사가 따로 기재하도록 되어 있습니다. 어제 보내드린 첨부화일 (胃 stomach)은 아래 목차 중에서 위암에 해당되는 부분으로서, 병리결과지 형식은 1장인 총론에 있으며, 요청하신 답변은 첨부화일 (ICD-O-3 이용의 실제)에 있습니다. 첨부화일 (ICD-O-3 이용의 실제) 중 "분화형/미분화형은 이와 별도로 병리의사가 따로 기재하도록 한다"는 해당 부분만 오려서 추가설명을 드리자면, 병리결과지 기재형식은 다음과 같습니다. 위암에서의 예를 총론에서 소개한 것인데, 세포 형태를 먼저 앞에 적고 그 뒤에 분화도를 별도로 따로 적도록 되어 있습니다. 이 원칙에 준하여 어제 보내드린 첨부화일 (胃 stomach) 7쪽 표6의 table footnote 첫 줄에 다음과 같이 적혀 있습니다. "분화도만 기재할 경우, 8140/3(선암)을 채용한다. 예: 중분화암 8140/32" 즉, 병리조직명과 분화도를 각각 기재하는 것이 원칙인데, 세포형을 적지 않고 부득이하게 분화도만 기재하는 경우에는 조직명을 8140/3으로 간주하겠다는 부연설명입니다. 현재 일본병리의사들은 개정된 위 기준에 맞춰서 세포형과 분화도를 각각 기재하는데, 'differentiated-type = 우리나라 병리의사가 판독한 Lauren’s intestinal-type'에 가깝고, 'undifferentiated-type = Lauren’s diffuse-type'에 가깝지 'PD + Sig + Muc'은 아니라고 합니다. 따라서 우리나라 위암 논문에는 분화형/미분화형 대신에 intestinal/diffuse이라는 병리판독이 기재되어야 합니다. 비록 mixed-type 때문에 고민되더라도 그것이 진실이기 때문입니다. 이를 지키지 않았을 때, 발생할 수 있는 구체적인 우리나라 예를 한가지만 들어보겠습니다. 현재 우리나라에서는 '미분화암'이라고 분류되고 있지만, 이 증례는 엄연히 Lauren’s intestinal-type으로서 일본에서는 '분화암'이라고 분류됩니다. 즉, 위와 같은 증례는 양국 병리의사들이 모두 '분화도가 좋은 암'이라고 분류하는데, 우리나라 임상의사들만 이를 '미분화암'이라고 마음대로 잘못 분류하는 오류가 행해지고 있어 답답해서 어제 메일을 드렸었습니다. 언젠가 EndoTODAY를 통해 진실을 알려주시기 바랍니다. 늦었습니다만, 좋은 의견 감사합니다. 분화형/미분화형 분류의 중요성과 혼선을 잘 지적해 주셔서 감사합니다. 특히 한일 양국의 차이점에 대한 정보는 매우 유용했습니다. 우리가 흔히 WHO 분류에 따른 W/D와 M/D는 분화형으로, P/D와 SRC는 미분화형으로 간주하고 있지만, 일본에서는 우리와 다르게 분류하고 있다는 점이 지적되었다고 생각합니다. 타당한 지적입니다. 그러나 몇 가지 의문점이 남아 있습니다. 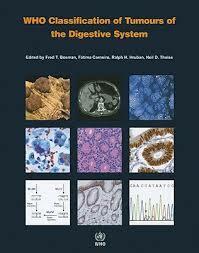 일본의 병리의사들은 'Lauren 분류의 intestinal type = differentiated', 'Lauren 분류의 diffuse type = undifferentiated'라는 것에는 모두가 동의하고 있을까요? 우리나라 병리의사들은 어떻게 생각하고 있을까요? 보다 근본적인 질문도 있습니다. 과연 일본이 정답일까요? WHO와 일본이 일치하지 않는데 우리는 누구를 따라야 할까요? 아무도 따르지 않고 우리 스스로 논의하여 우리 방식을 채택하면 안될까요? 일전에 선생님께서 제안하신 바와 같이 병리과 의사가 병리 보고서에 분화형인지 미분화형인지 명확하게 써 주고, 내과 의사는 병리과 의사의 말을 그대로 가져다 쓰는 것이 최선입니다. 병리과 의사의 보고서 내용을 기초로 내과 의사가 적당히 다른 말로 바꾸어 사용하거나 regrouping 하는 것은 좋은 방법이 아닙니다. 일본 데이타를 바라볼 때에는 우리의 용어와 일본의 용어가 표현은 같아도 내용이 다르다는 점을 고려해야 할 것 같습니다. 비단 의학뿐만 아니라 많은 분야에서 전문용어의 사용법이 양국간에 큰 차이가 있습니다. 향후 우리나라에서 '분화형/미분화형' 용어를 어떻게 사용할 것인가에 대한 토론이 있어야 할 것입니다. 현재처럼 그냥 대충 사용하는 것은 옳지 않다는 점에 동의합니다. 감사합니다. 보내주신 질문들에 대한 답변은 이미 잘 알고 계신 것 같아 자세히 설명드리지 않아도 될 것 같습니다. 병리의사들간의 차이는 크고, WHO와 일본기준은 다르므로 우리 임상의사들은 우리나라 병리의사들의 판독을 따르면 되는 것입니다. 그런데 따르지 않는 이유는 현재 병리의사들이 WHO 기준에 준해서 제공하는 지식이 임상의사들의 기대치에 한없이 부족하기 때문일거라 감히 말씀드립니다. 예를 들면, 내시경 조직검사상에서 위암이 진단되어도 병리판독지에 Lauren's classification이 없으므로, 결국 내시경적 절제술을 할지 결정하기 위해서 스스로 "WHO분류상의 WD+MD 위암은 일본분류상의 분화형암", "나머지 조직형은 미분화암"이라고 간주한 뒤, 내시경 절제술의 절대적응증인지 확대적응증인지 판단하고 있는 셈입니다. 외과의사들도 비슷한 심정일거라 생각하는데, 수술 후 병리판독지에 Lauren's classification이 mixed type이라는 도움 안되는 판독을 볼 때마다 현실과의 괴리가 심해져서, 내과의사들과 마찬가지 입장이 되는 것이라 생각합니다. 그 와중에 나오는 조기위암 내시경치료 시대에 위 생검과 절제 검체 간의 진단 불일치(대한소화기학회지 2014)와 같은 한글종설은 좋은 핑계거리일 뿐입니다. "WHO 분류만으로는 결코 이해할 수 없는 일본 이분 분류법의 심오함 때문에 위암환자를 무리해서라도 이분법으로 분류해야 하는 임상의사들의 절박함"을 병리의사들이 조금만이라도 이해한다면, 선생님께서 적으신대로 우리도 다른 나라 분류에 크게 휘둘리지 않고 떳떳하게 우리만의 기준을 따를 수 있을 것입니다. 내친 김에 그동안 병리 위암 전문가 집단에게 요구하고 싶었던 바램까지 적겠습니다. 위암 병리전문가 양성 과정에 작은 내시경 조직검사 검체만으로도 Lauren's classification으로 분류할 수 있는 교육과정이 있어야 합니다. Lauren's mixed type을 남발하지 않고, intestinal-predominant type이나 diffuse-predominant type으로 판정하려는 노력이 있어야 합니다. 이도저도 싫으면 "위암 절제술을 볼 일이 거의 없는 나라의 병리의사들이 만든 WHO 위암 분류"를 고집할게 아니라, 일본의 위암 이분법을 응용한 교육과정이라도 만들어서 임상의사들의 눈높이에 맞는 병리판독을 제공해야 합니다. 어디까지나 제 생각이므로, 틀렸다고 생각하신다면 알려주세요. 아뭏든 바쁘신 중에도 늘 열심히 공부하시는 선생님이 존경스럽습니다. 사실 평행하게 발전하는 것이 맞습니다. 진단 내시경과 치료 내시경이 함께 평행하게 발전해야 합니다. 내시경 의사와 병리 의사도 함께 발전해야 합니다. 평행이라 함은 방향과 속도를 모두 말하는 것입니다. 같은 방향으로 같은 속도로 발전하는 것이 이상적입니다. 우리나라 내시경계는 진단 내시경은 그대로인데 치료 내시경만 발전했습니다. 누구 하나 내시경 교육에 대하여 전문적으로 연구,개발하고 있는 사람이 없으며, 누구 하나 확대 내시경을 전문적으로 연구,개발하고 있는 사람이 없습니다. 큰 병원 의사들은 모두 몰려오는 조기위암 환자들은 내시경으로 치료하기에 급급한 실정입니다. 우리나라 내시경의사와 병리의사들은 추구하는 방향이 다릅니다. 저와 같은 내시경 의사들은 몰려오는 위암 환자들을 치료하기 위하여 일본에서 개발된 도구를 이용하여 일본에서 개발된 방법대로 내시경 치료를 하고 있습니다. 미국에서는 배울 것이 거의 없는 실정입니다. 반면 병리의사들은 아직도 미국식 병리를 추구하고 있습니다. 내시경 절제술 후 상세한 mapping과 상세한 분석은 매우 중요한 일임에도 불구하고 우리나라 병리에서는 거의 찾아볼 수 없는 일입니다. 미국과 비슷하게. 저의 관점은 이렇습니다. 조기위암 내시경 치료는 100% 수입된 치료법인데, 모든 것이 다 함께 수입된 것은 아니다는 것입니다. 치료법의 일부만 도입되었고, 그 앞뒤의 여러 전제 조건들은 수입되지 않았습니다. 진단내시경 부분이 수입되지 않았고 병리판독 부분이 수입되지 않았습니다. 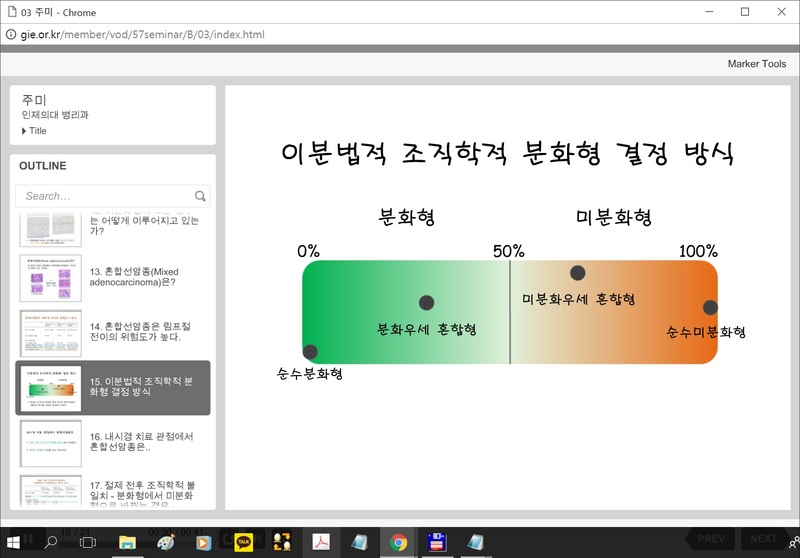 오직 자르는 techinique만 수입되었습니다. 지금부터라도 좀 더 논의하여 우리의 실정에 맞는 우리의 진단법, 우리의 치료법, 우리의 병리 판독법을 함께 개발하는 수 밖에 없습니다. 상당히 많은 문제는 박정희 독재정권하에서 만들어진 저수가 제도에 기인합니다. 병리과 선생님들은 일을 하면 할수록 적자인 구조에 일하고 계십니다. 엄청나게 밀려오는 검체들을 대충 보기에도 시간이 모자랍니다. 병리 의사가 너무 모자라기 때문에 대형병원에서도 위내시경 조직검사는 위장관 질환 전문 병리의사가 보는 것이 아니고 아무 병리 의사나 보고 있는 실정입니다. '병리과 선생님께 내과 의사와 상의하여 서로 더 좋은 방향으로 노력해보자' 제안하는 것도 좋지만 병리 수가구조를 개선하는 노력도 함께 진행되는 것이 좋을 것 같습니다. 여하튼 감사합니다. 크게 도움이 되었습니다. 2015년. 고령 환자에서는 위암과 함께 다른 질환이 발견되기도 합니다. 이 경우는 multiple myeloma였습니다. 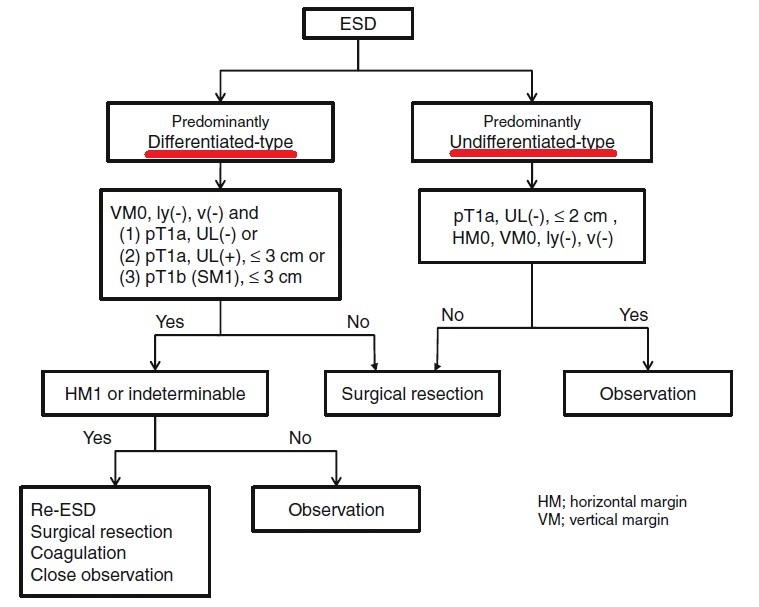 위암의 조직검사는 poorly differentiated carcinoma였고, CT에서 regional node 들과 함께 복막전이가 의심되었습니다. O & C가 될 확률이 높아서 사전에 열심히 설명하였습니다. 아쉽게도 수술장에서 복막 전이가 확인되었습니다. © 일원내시경교실 바른내시경연구소 이준행, EndoTODAY Endoscopy Learning Center. Lee Jun Haeng.